The last three months have been a learning experience for First Year Engineering Student Robbie Powell. Powell competed in his first two major championships, including October’s Youth Olympic Games in Buenos Aires, Argentina. However, Powell was first part of the Ireland team that took part in the European Swimming Championships in Glasgow in August. Powell was part of the men’s 4×100 Freestyle Relay team that broke the Irish Senior Record. Alongside Shane Ryan, David Thompson and Jordan Sloan, the quartet took two seconds off the previous record, with Powell bringing them home in a time of 3:17:55. “I felt I gained more experience with competing at a major scale at the European Championships. I was racing the best senior male swimmers in Europe,” Powell told The College View. “I saw how the operate before, during and after races. It was quite different to junior swimmers that I was accustomed to competing against. “I observed these differences and used it to my advantage. It was also very useful when I got the chance to deal with pressure of the media and being on TV for everyone at home to see me,” Powell said. Powell then headed to Argentina, where he competed in three events at the Youth Olympic Games, competing in the 50m Freestyle, 100m Freestyle and the 50m Butterfly. The Athlone man felt the Youth Olympics were a very different experience, introducing him to a big scale multisport games for the first time. “The Youth Olympics on the other hand were on the other side of the world and they introduced me to a big scale multisport games. 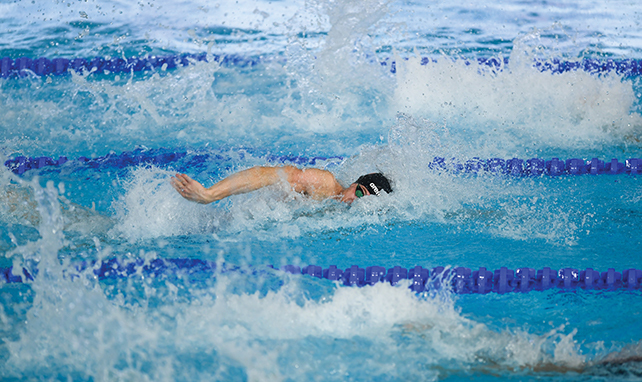 “I had less pressure on me to perform in the pool so swimming fast wasn’t the main focus for me. Tactics were the focus in the pool and I learned from it. “I found the village life a bit overwhelming at first as I found myself walking around doing fun activities and treating myself to the free food and drink, the Olympics are sponsored by Coca-Cola,” Powell said. “I had to learn how to get the best out of my performance while being in an unusual atmosphere. I didn’t have a cosy bed in a nice hotel in somewhere familiar with nice scrambled egg for breakfast. “I had to adapt and that’s why I see the Youth Olympics as a beneficial experience for the real Olympic games rather than for any other swim competition,” Powell said. Powell’s father was a swim coach so he was introduced to the sport at a young age and stressed that the journey to qualifying for two major championships was a long journey. “My father was a swim coach so he always had me in the pool since I was young. From then, I always made the next step towards where I am today. Irish swimming seems to be making strides, shown further by Shane Ryan’s bronze medal in Glasgow and the success at the Youth Olympics of Powell, Mona McSharry and Niamh Coyne. “I’m glad to be a part of it and this success will continue. I think the success is due to the hard work swim Ireland have been doing to make Ireland a household name at major international meets,” Powell said. The likes of Brendan Hyland, Cillian Colvin and Ben Griffin have all swam for DCU and Powell admitted that was a factor in him choosing DCU as his college to study in. Image Credit: David Fitzgerald / Sportsfile.